Learn Today - Earn Tomorrow! RACS is proud to encourage and support student scholars with career aspirations in science, technology, engineering, mathematics and health related fields. We are the only charter school that has established a partnership with Monroe Community College (MCC) to help students prepare academically for the exciting career opportunities these specialized professions will offer in the coming years. 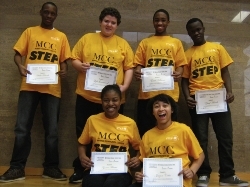 Students who complete the high school STEP program will most likely be enrolled in the CSTEP program at Monroe Community College (MCC). The Collegiate Science and Technology Entry Program, also known as CSTEP, is nationally recognized by the United States Department of Education Office of Vocational and Adult Education as one of the nation's top eight programs.